So this may be lengthy but I’ll try to type what I’ve got in my head. Ok so I said all that to ask this, with the top being glued and knowing that wood is alive. 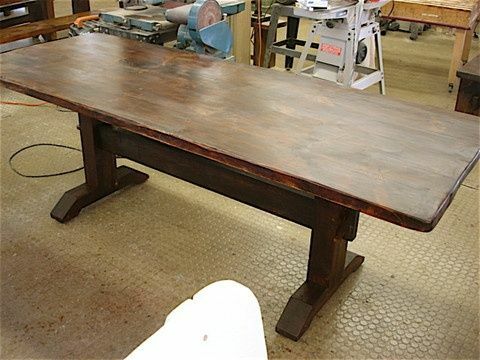 Should I put an edge band around the table, like a 2×4 or 1×4 (rustic board) to help with movement or would the epoxy cause/help any issues, with movement as well. I’m going todo a mock up in cad and use as a guide to get sizes and cut etc. but I keep going back to the top moving and am worried it’s gonna split wide open. Thank you for your future help. I like the horizontal supports in the middle, but not the leg frame construction. I plan on using mortise and tenon joints, but have thought about some kind of a sliding dovetail on the underside? maybe…I haven’t’ done enough dovetails to take on something like yet. Loren is a 100% correct. Take a look at this thread to see ways of connecting tops but still allowing for wood movement. Thx. The site is very well put together, building friendly. As in, post your stuff up, show off work, projects etc…rather than just asking questions. But theres nothing wrong with asking questions. Those would allow movement, but what about the epoxy covering the top? Is this something that will cause the “bottom” to swell because the top is “not moveable”. I know I could put several coats of clear coat or poly, lacquer etc. instead but I really like the bar top look. No, edge banding will cause endless problems with wood movement. You can’t stop wood movement, only allow for it. Attaching the base will be the critical step in allowing for wood movement. 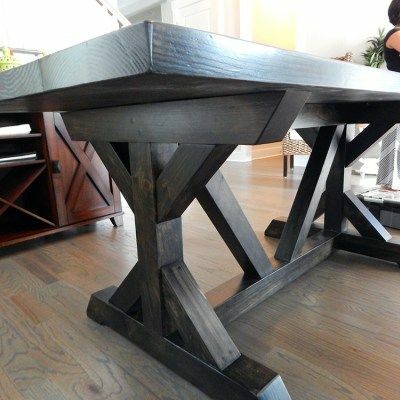 I would guess for that design you are going to use lag screws to attach the trestles, which will be fine if you use oversized or slotted holes in the trestle when attaching the top, so the top can move with changes in humidity. Those would allow movement, but what about the epoxy covering the top? Is this something that will cause the “bottom” to swell because the top is “not moveable”. The top will move regardless of what finish you use. But to prevent cupping you should put at least a seal coat that is similar to the top coat on the underside. So the the top surface and the bottom surface react equally to changes in humidity. Bingo, have a new answer I never thought of. I’ve heard of people putting a very thin layer of epoxy to seal up the wood, then they’ll pour the thickness there going for. I guess I can “seal” it on the underside, after its pretty much done…I was hoping there would be something that would either not allow the wood to move much, or allow the wood to move more uniformly.